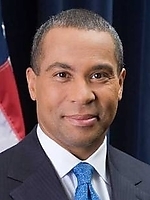 Info From the South Side of Chicago to the highest levels of government to the boardrooms of two Fortune 500 companies, Deval Patrick has lived the American dream. Through almost four decades of that journey, the values, institutions, and people of the Bay State have been fundamental to his success. Born in 1956, Deval grew up in one of Chicago's toughest neighborhoods, living on welfare and sharing a single bedroom with his mother and sister. Public leadership and the power of possibility captured Deval's imagination early on when his mother brought him to hear Dr. Martin Luther King Jr. speak in a South Side Chicago park. "I remember feeling connected to all these people who were like me - of limited means, but limitless hope. People build whole lives on hope." First in his class in middle school, Deval's potential was recognized by a teacher who recommended him to A Better Chance, a Boston-based organization that awarded him a scholarship to Milton Academy in Milton, Massachusetts. "Coming here [to Massachusetts] was like coming to a different planet," Deval explained years later. "Other kids were complaining about how small and spare their dorm rooms were…And here I had my own bed and desk. I thought, 'this is pretty nice.'" Deval thrived in his new surroundings. He excelled in the classroom, served as editor of the school paper, and delivered newspapers on campus and in surrounding neighborhoods, including the one his family now calls home. While he was at Milton, Deval returned to Chicago on school breaks and worked in a small factory, as a janitor with his grandfather, and bussing tables in a downtown restaurant. After graduating from Milton in 1974, Deval attended Harvard College, the first in his family to be formally educated beyond high school. When he called home to tell his family he had been admitted, his grandmother paused in her excitement and asked, "Where is that anyway?" Of that comment, Deval says, "it was the opportunity, not the prestige that mattered." Graduating from Harvard with honors in 1978, Deval then lived and worked in Africa for a year, most of that time on a United Nations youth training project in the Darfur region of Sudan. While abroad, he applied and was admitted to law school and returned to Cambridge to attend Harvard. There, he was elected president of the Legal Aid Bureau and gained his first trial experience defending poor families in the Middlesex County Courts. He also won the prestigious Ames Moot Court Competition and was named best oral advocate in his class. A distinguished record of service and advocacy. After serving as a law clerk for a year to a federal appellate judge, Deval joined the NAACP Legal Defense Fund (LDF) in 1983 where he devoted most of his time to death penalty and voting rights cases. It was at LDF that Deval first met then-Governor Bill Clinton whom he sued in a voting rights case in Arkansas. Clinton worked with Deval to settle the case and the two began a relationship of strong mutual respect and admiration that continues today. During this time, Deval married Diane Bemus, an attorney specializing in labor and employment law whom he met after friends set them up on a blind date. "It was supposed to be a costume party, but I was the only one there in costume," recalls Deval. Deval left LDF in 1986 to join the Boston law firm of Hill & Barlow, where he became a partner in 1990. In addition to his private practice, he spent much of his time on pro-bono work, including a landmark lending scam case on behalf of Massachusetts' senior citizens. He also served as volunteer Chairman of the NAACP Legal Defense Fund's New England Committee and as a member of its National Board of Directors. In 1994, President Clinton appointed Deval Assistant Attorney General for Civil Rights, the nation's top civil rights post. Deval worked on a wide range of issues at the Justice Department including the investigation of church burnings throughout the South in the mid-1990s, prosecution of hate crimes and abortion clinic violence, cases of employment discrimination, and enforcement of the Americans with Disabilities Act. Bold, decisive leadership determined to make a difference. Deval returned to private practice in 1997 with the Boston firm of Day, Berry & Howard. That same year, he was appointed by a federal district court to serve as the first chairperson of Texaco's Equality and Fairness Task Force, following the settlement of a significant race discrimination case at the company. He and his Task Force carefully reexamined and rebuilt the company's entire system of employment practices in a successful effort to create a more equitable workplace for everyone. Recognizing his unique ability to bring people together to get things done, Texaco hired Deval as Vice President and General Counsel in 1999, placing him in charge of its global legal affairs. Next, Deval joined The Coca-Cola Company as Executive Vice President and General Counsel. He was elected to the additional position of Corporate Secretary in 2002. In these roles he was responsible for the company's worldwide legal affairs. He also served on the Company's Executive Committee - its senior leadership team. After nearly six years of commuting to Atlanta and New York, Deval resigned his post at Coca-Cola last year. A commitment to the principles and ideals that work to benefit all of the citizens of the Commonwealth. Deval has served on several charitable and corporate boards, as well as the Federal Election Reform Commission under Presidents Carter and Ford, and as Vice Chair of the Massachusetts Judicial Nominating Council by appointment of Governor Weld. He is the recipient of seven honorary degrees, including from Clark University in Worcester, Suffolk Law School in Boston, Northeastern University School of Law in Boston, and Curry College in Milton. Deval and Diane have two daughters, Sarah, 19, and Katherine, 15. They have lived in Milton, in that house on Deval's old paper route, for 16 years. His sister and her family are also residents of Milton, as were his late mother and grandmother.